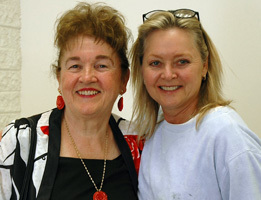 Joyce Raymer (L) - Joyce brings her elegant grace and creative ideas to everything she touches. Reliable, helpful, thoughtful and extremely organized...we are grateful for the many positions and contributions you graciously volunteer for year after year. Well done Joyce! Ivy Bodin (M) - the OGR Guru. 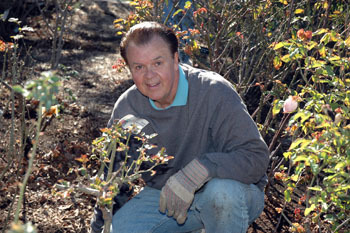 Long time friend and mentor to many rosarians, Ivy has inspired many people through his extensive knowledge and passion for roses. Ivy designed and planted the rose garden at the historical Magee House in Carlsbad. CCRS thanks you for this magical place.Our "Ivy of the Roses" is a living legend. 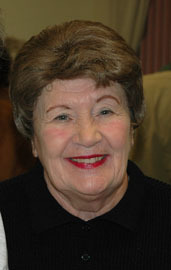 Gwen Cleary (R)- You can always count on Gwen. Her smile and willingness to help at every turn is appreciated by everyone. Never afraid to roll up her sleeves and "dig in". Gwen is the selfless, quiet, gentle rock solid backbone of CCRS...she is as beautiful as the roses she grows...we appreciate you so very much and all you do! Deb Bryan - CCRS President for three years. Deb shared her awesome creativity and leadership with CCRS while graciously opening her home to the entire membership for parties. Deb set us on fire with her enthusiasm and love for roses. Deb designed and donated our beautiful CCRS logo that embellishes our CCRS products. Deb was also instrumental in introducing CCRS to professional rose marker name tags for the Magee rose gardens. If that was not enough....Deb is a master rose exhibitor - all beauty, brains and talent behind her gorgeous roses. Thank you Deb for the beauty and brilliance! John Bagnasco - has brought a wealth of inspiration and knowledge to California Coastal Rose Society with his terrific sense of humor and fascinating presentations. John is an all around nice guy, willing to share, teach and roll up his sleeves at CCRS. John draws big crowds when he speaks and leaves everyone wanting MORE. His devotion to our annual auction with Joel Ross is a wonderful tradition at CCRS. John, you are our beloved home town celebrity who brings fresh, new ideas to the club - we thank you for all you do for CCRS. Col. Phil Ash - "Mr. Del Mar Fair"....Phil has inspired and educated multitudes of people in all areas of roses from rose care to exhibiting. Notorious for selflessly helping new exhibitors prepare their roses for a rose show, Phil has set the bar for all of us by demonstrating the true spirit of roses - the sharing of his passion and knowledge of roses. 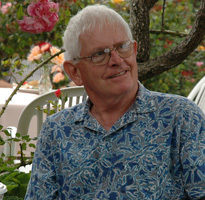 A mentor and great friend to many, Phil is responsiible for many beautiful rose gardens across the Southwest. Thank you Phil for all those you have inspired at CCRS and across San Diego County! Ruby Kewley - Original Founding member of California Coastal Rose Society. Ruby Kewleys eyes sparkle when she describes the "old days" at CCRS. Ruby recalls the day a hand full of members followed Grace and Slim Grider and began a new rose club in 1988. 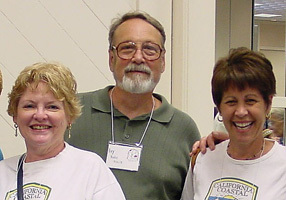 Their love and enthusiam for roses united the core group which began California Coastal Rose Society. All of us who know Ruby appreciate her helpful nature and organization. No leaf goes unturned! Her beautiful English accent sounds like music while she expresses her love for roses. On the eve of Joel Ross's Bronze Medal presentation, Ruby said "I just love the people here..." We love you too Ruby. 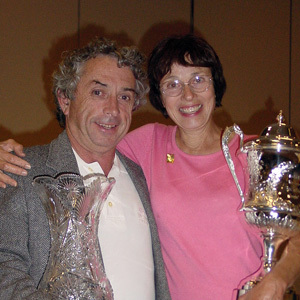 Frank and Cherrie Grasso - National Rose Show Champions, Frank and Cherrie Grasso spent many years as mentors for many budding rosarians in Southern California. We miss them very much since they moved to Ohio. Thank you Frank and Cherrie for the many positions you held at CCRS, the helpful advise, the inspiration, the laughs and the classic moments ala Grasso! The Grassos have donated hundreds of roses to CCRS over the years, many are happily blooming in the Magee Rose Garden, the pride of CCRS. Frank and Cherrie, you bloom forever in our hearts! 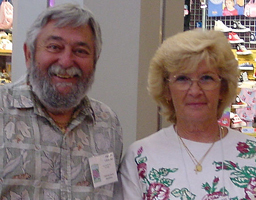 Alan and Geri McCarron - Alan and Geri are living legends in North San Diego County. Anyone who knows the Del Mar Fair Garden show, associates the McCarrons with multitudes of blue ribbons. 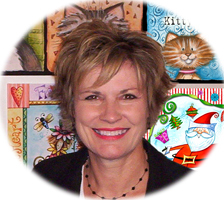 Geri was CCRS newsletter editor for two years, designed the CCRS Del Mar Fair exhibit 5 times. Geri discovered CCRS in 1989 when she showed up at the fair with leafless roses floating in cooking kettles. Founding members, Bill Willetts and Grace Grider took her aside,gave her some hints and invited her to a CCRS meeting. 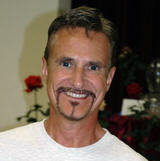 Alan is a great partner because he likes to work outdoors, and a rose show brings out the showman in him. Alan mostly likes to give roses to friends, he doesn't see any point in judging one flower as champion over another, but Geri says..."he did help groom the rose that won national queen in 2004." Special THANKS to Carolyn Buman and Mary Muehler-Frank for many years of superb rose shows. GREAT team work. Mary lights up the room with her signature smile and enthusiasm, even among the hectic pace of a rose show! Her role as CCRS auctioneer for several years was fabulous! Carolyn must have written the book on rose arranging. Her talent as an exhibitor and her vast knowledge of judging are astounding. CCRS thanks you both for the awesome team you are! Bob Woelffer - Bob is the current Magee Garden Director who makes everything fun for those who volunteer in the garden. Hard working and always willing to lend a hand, Bob is present at every event helping load and unload properties at our show, clean up, placement...any job great or small, Bob lends a hand. We are fortunate to have Bob as part of the CCRS family, along with his lovely wife Barbara. Thank you Bob for your selfless devotion to CCRS! All photos by Brenda Landers-Smith with the exception of Deb Bryan,courtesy of Deb Bryan.